Audi has revealed a new stretched five-door version of its TT Coupe at the Paris Motor Show. 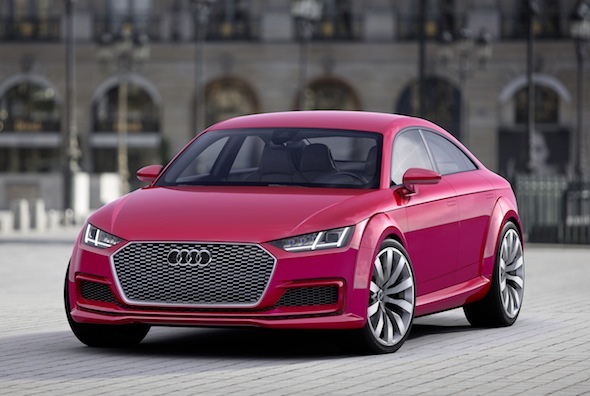 Called the TT Sportback, this practical model is the third concept car based around Audi's popular sports coupe. It joins the rugged TT Allroad and high-riding Offroad versions, which were unveiled at the Detroit and Beijing Motor Shows respectively. Drawing inspiration from its niche-busting A5 and A7 Sportback coupe models, the TT Sportback is the best hint yet that Audi intends to extend the TT range beyond the current coupe and convertible variants. Certainly, such a model would be needed if Audi is to fulfill its goal of having 60 individual models on sale by 2020. The TT Sportback is styled differently to its coupe sibling, featuring a much wider and flatter grille design, different headlights (with a unique LED daytime running light signature) and more curvaceous bumpers. However, it does directly carry over some design details from the current model. The crease running the length of the car and the smoothly curved roofline leaves onlookers in no doubt that this is an Audi TT. The rear of the car is slightly elongated and features a smaller rear windscreen. Sitting below that is a gentle boot-lip spoiler and new light clusters that are slimmer than those found on the new Coupe. Inside, the cabin is lifted directly from the TT Coupe, and has the same 12.3-inch virtual cockpit display, and digital control panels built into the air vents. In the back, two individual seats are split by a central armrest. These can be folded down to maximise load space. Under the bonnet sits a 394bhp 2.0-litre turbocharged engine – a unit that is not likely to be offered should the Sportback be given the green light for production. It's mated to Audi's quattro four-wheel-drive system and a seven-speed S tronic twin-clutch gearbox. Audi claims that with this engine, the TT Sportback will sprint from 0-62mph in just 3.9 seconds, and yet still return combined fuel economy of 162g/km. "With the TT, Audi created one of the automotive design icons of the last 20 years," said Prof. Dr. Ulrich Hackenberg, Audi Board Member for Technical Development. "In the years since, we have designed our sporty and elegant five door Audi A5 Sportback and Audi A7 Sportback. In our Audi TT Sportback concept show car, we are now fusing both concepts to form a new member of a potential TT family." Is a five-door TT a step too far? Check out our Vine from our live coverage of the Paris Motor Show and decide for yourself.